From Lana Grossa, this is always one of my favorites. I pretty much like everything in this issue. Visit the website - you can see pictures of all of the projects in this issue. Design 14 - Beautiful sweater knit with the front and back worked side to side, and a nice cable across the top. Knit with Lana Grossa Taglia, 100% cotton yarn. Design 17 - Gorgeous hoodie knit in a drop stitch pattern, using Lana's yarn called Marmo, a 35% cotton, 35% viscose, 30% silk blend. Design 35 - Fabulous cabled turtleneck for the guys (but I would wear it myself!) knit in Ambiente, 85% recycled cotton and 15% recycled cashmere. Mayville Cardigan by Sarah Fama, a super stretchy stitch is used for this simple jacket. The sleeve silhouette is easily achieved - drop sleeves are worked without shaping to give a wide cuff and relaxed shoulder. 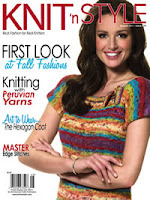 Love of Knitting Spring 2011 has 28 flirty spring knits - scarves, shells, vests and cardigans. Also, learn to knit bobbles. Sunny Day Jumper by Amy Polcyn for Aslan Trends for little girls - super adorable with adjustable straps make it wearable for this and several seasons to come. Azure Shawl by Nancy A. Boccuzzi is a beautiful lacy shawl with a ruffled edge is knit with Lucatape yarn, by Lucci Yarns. This pretty yarn has tiny sequins woven into the fiber to give it a little something extra special. Very pretty! Bast Fibers: Article by Deborah Robson : A brief description of how yarn is made from these fibers as well as a review of several, including Louet Euroflax Sportweight and Halcyon Block Island Blend. Amelia Hoodie by Erica Jackofsky - Lovely sleeveless hoodie is knit in stocking stitch, with a band of whipstitched swatches, knit with Malabrigo Organic Cotton. 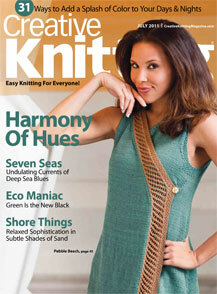 Lots more awaits you in the Summer 2011 Issue of Interweave Knits. Be sure to get your copy! I always say this at the beginning of magazine reviews... this is one of my most favorite! Let's face it, all of the magazines I review are my favorites, or I wouldn't read them. So... here we go! 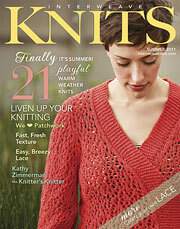 New Yarns Review: I love this section - it always adds at least one yarn to my wish list! Plus lots more, don't miss this issue! Just received the lastest issue the other day! I love this magazine! As always, this magazine does not disappoint. Pick up your copy today!